American Tug 41-021 Tsillan is… Sold! I worked very closely with the owner when we had Tsillan constructed in 2007. He had previously made 5 trips to Alaska on his last boat and was specific in how Tsillan was to be optioned and outfitted. It was nice to work with a gentleman that had very well found opinions and made great decisions in her commissioning. She is a fabulous American Tug 41! 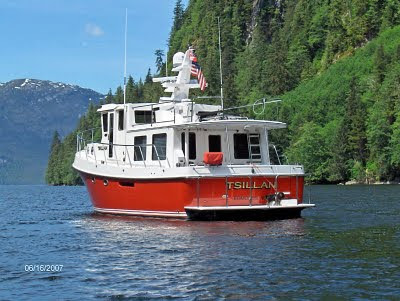 Tsillan was built for an experienced yachtsman and includes many special touches. She has the Cummins QSC-540 common rail engine, Onan 9Kw gensest, Village Marine 600 watermaker, Nick Jackson 3-axis crane, Raymarine electronics suite with 3ea multifunction displays & 48-mile open array radar. She is a beatiful boat. Deep brick red carpet and upholstery with gorgeous Jatoba wood. Call Steve to arrange a private tour at 206-930-6139. She has always been moored in a covered slip in Edmonds, WA.